Facing jeers over outlandish pay, the CEO of Goldman Sachs stresses the social goods of his firm's business. 'We contribute to growth,' Goldman chief Lloyd Blankfein said Friday. NEW YORK (Fortune) -- Furor over bonuses shouldn't obscure the role Goldman Sachs plays in fostering global economic growth, CEO Lloyd Blankfein said Friday. Blankfein, speaking at a breakfast conversation hosted by Fortune, emphasized that the investment firm serves "an important social purpose" by channeling pools of money held by pension funds and others to companies and governments around the world. Those investments, Blankfein told Fortune's managing editor Andy Serwer, help create economic growth that creates wealth and lifts living standards. "We contribute to growth," Blankfein said. "Once the economy starts to turn, we get very involved." Blankfein's comments come as Goldman (GS, Fortune 500) is under pressure for the enormous sums of money it stands to pay its workers. On Thursday, Goldman reported a $3.2 billion quarterly profit. The firm is on track to match its biggest-ever compensation outlay, from 2007 -- when unemployment was half its current level and giant financial firms hadn't yet received enormous infusions of federal aid. Through the end of the third quarter, Goldman had set aside $526,814 for each worker -- putting the record annual average payout of $662,000 within reach. Asked whether the firm had undertaken a "charm offensive" in response to the press brickbats over compensation, Blankfein suggested Goldman has if anything been too reticent about its strong points. 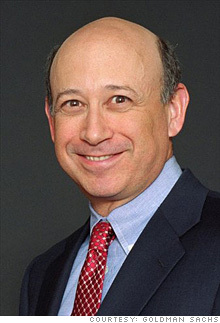 "It's not a charm offensive," Blankfein said. "We're doing things we should have done all along to show people what we do in the world." Blankfein also shrugged off the charge that the firm is making most of its money by speculating using cheap government funds in stressed markets. Revenue at the firm's trading businesses rose fourfold from a year earlier in the third quarter. But Blankfein said principal trading -- trades the firm makes for its own account -- makes up just a small fraction of Goldman's profits. Blankfein also stressed that Goldman emphasizes teamwork, performance and long-term thinking in compensating its workers. He said this view stems from the firm's 130-year run, from its founding through its 1999 initial public offering, as a partnership, in which partners were expected to contribute capital in lean years as well as receive substantial sums in good ones. "We regard it as a key element of our success," Blankfein said. He said this culture is central to "our ability to recruit, retain and motivate people." As for Goldman's entanglement with the government, Blankfein said he didn't realize the $10 billion the Treasury lent the company last fall when the financial system was teetering would come with so many strings attached. "Had I known it was this pregnant with this potential for backlash then I would not have liked it," he said. Blankfein also said Goldman didn't need the money, though he conceded the point is moot, as the nine biggest banks weren't given an opportunity to refuse the Troubled Asset Relief Program funds. Blankfein added that while he is "not blind to the interests of society," his duty is to serve Goldman shareholders -- which he said ends up being good for the U.S. as well. "As hard as some of these issues are, I have to pursue the interests of shareholders," he said. "I can't do too much that subordinates the interests of our shareholders. If I did do that I certainly wouldn't be helping the country."